A program and ice cream social mark the start of a yearlong celebration to mark a half-century of outstanding education, research, clinical care and community engagement. All employees, students and faculty are invited to join the celebration. 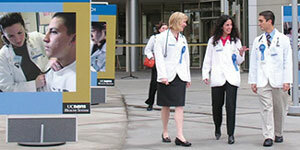 As the year progresses, UC Davis will reflect on the School of Medicine's journey over five decades, the evolution of medical education and research, as well as the future of medicine and what UC Davis envisions in the next 50 years to build a healthier future for all.